It is habitual to get distracted by ourselves(more than something distracting us) while we are studying for the exams. What do we do in such cases? Well, maybe have a Cup of Coffee? Play Games? Watch Television? Sleep? Whatever we do, I bet it is much more enjoyable than studying for the exams. On the Contrary, seldom we get distracted by ourselves(perhaps, it wont be wrong, if I say never, ever, do we get distracted) while playing games. And what do we do when someone distracts us? Scold them? Punch them? Well, before that we make sure we pause the game. Right, pause the game! This is the feature that has saved many relationships, lives, and what not. Right, so this is precisely what we will be learning today. 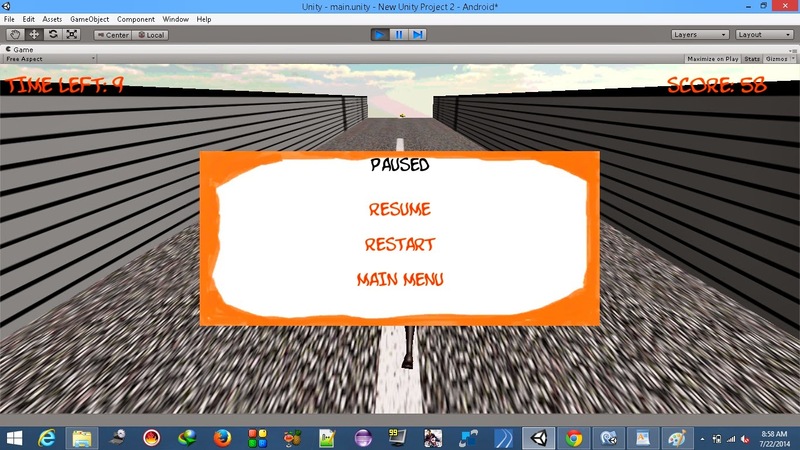 To add a Pause Menu to our game. Here, we check if the user has pressed the escape/back key. And regardless of what the status of the paused variable is, we are inverting it. We are pausing the game if it's active or resuming the game if it's paused. 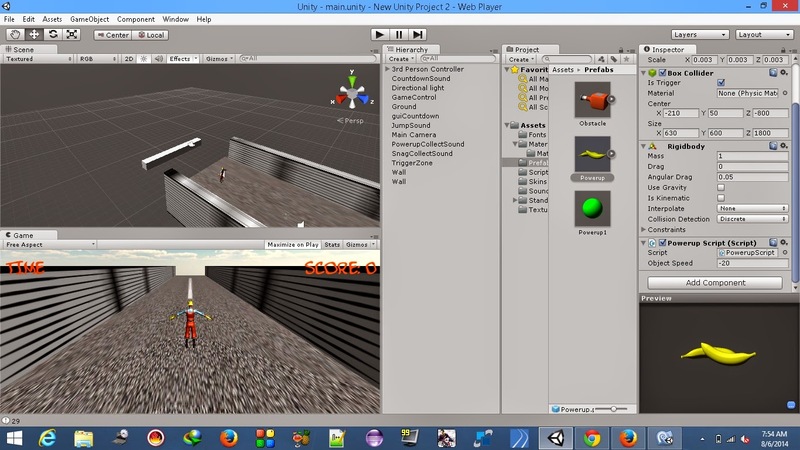 The above lines of code are pretty similar to the Game Over menu that we saw in one of the earlier posts. For the Restart functionality of the Pause Menu to work, we have to set back the Time.timeScale to 1. 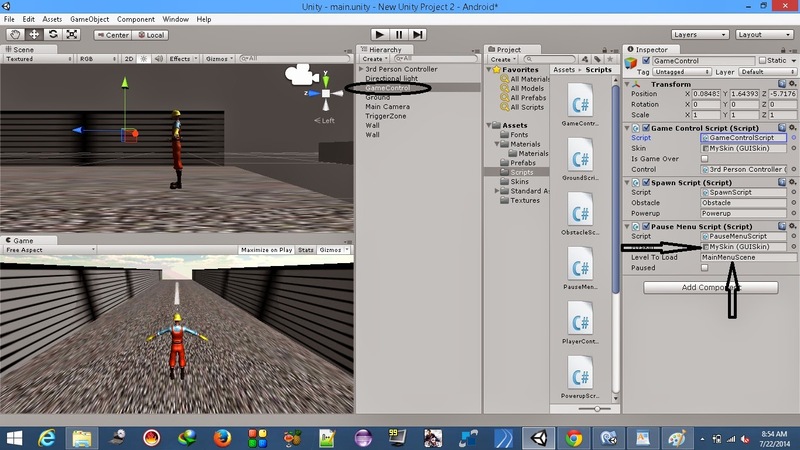 Now select the GameController game object in the Hierarchy so that we can see it's components in the Inspector. You will notice that the PauseMenuScript script is expecting a GUI skin, drag and drop the custom GUIskin that we created in the previous post. Also, there is one more field named levelToLoad which is expecting some value. Type MainMenuScene in it. Though we have not created the MainMenuScene yet, we will be doing so in the next post. 1) Check if the Time.timeScale is 1 before translating the object. If you save the scripts and try testing the game now, you will find that we have successfully completed adding the Pause functionality to our game. The Bananas will not move, well at least in my project, i know that dont make sense, can you help me? That should work alright. I'm not sure why it ain't working for you. Are you getting any errors? Where are all the codes. As the project discount. when click on resume after pausing the game, one more menu displayed which we priviously created without GUIskin...hence again we required to resume....please tell me what can i do...and sorry about my English..